The BD Influx™ fluidics system features a unique acoustical coupling in the nozzle assembly to reliably create droplets for sorting, while ensuring low shear stress to optimize cell viability, even at high pressures. To support aseptic sorting, the fluidics path is easily removed and replaced with the optional disposable fluidics kit. The core of the BD Influx system is the nozzle assembly, which features an optimized acoustical coupling, enabling the most efficient droplet formation. This unique design minimizes noise from the droplet formation process and results in high droplet formation rates at relatively low sheath pressures. In addition, the form of the nozzle assembly enables cells to accelerate smoothly to the laser intercept, increasing the viability and functionality of even the most fragile cells. A variety of nozzle sizes are available to allow researchers to easily adapt the system to different cell or particle types. A sample station and fluidics console control sample flow, sample line backflush, boost, and differential pressure. Bubble detectors prevent air bubbles from reaching the nozzle by stopping flow when the sample tube is empty. Stainless steel pressurized sheath and waste tanks allow researchers to adapt cleaning procedures to match their application needs. An important concern in cell sorting is cross-contamination, either between samples or with foreign biological agents such as bacteria, viruses, and DNA. To mitigate the risks of cross-contamination, researchers can replace the sample line in a matter of minutes. The sample line extends into the nozzle tip to minimize contact between cells and non-replaceable parts. For rigorous control, the complete fluidics system, from sheath tank to nozzle tip, can be exchanged. 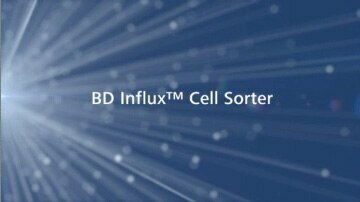 The unique design of the BD Influx fluidics system allows for rapid exchange of all parts that potentially contact cells, addressing cross-contamination concerns.